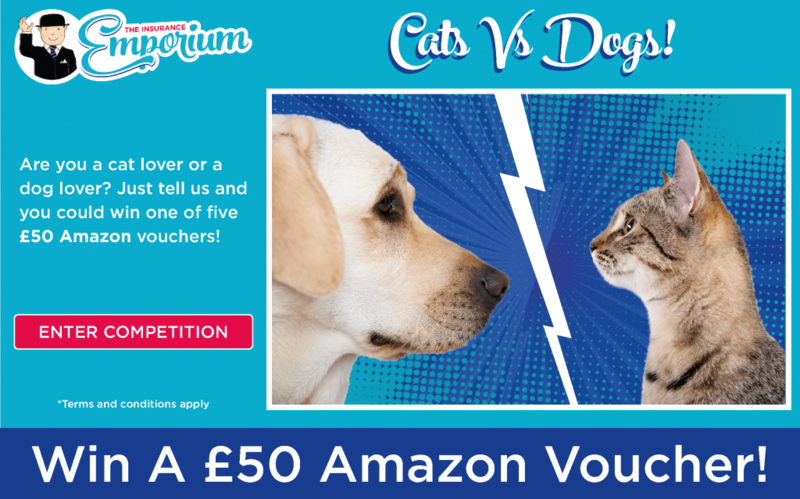 CATS VS DOGS: PICK ONE AND YOU COULD WIN A £50 AMAZON VOUCHER! It’s one of the biggest questions in life – are you a dog or a cat person? Does the sound of a purr make you weak in the knees or send shivers down your spine? Do you make a fuss of every passing dog, or cross to the other side of the road? Let The Insurance Emporium know to be in for a chance of winning one of five £50 Amazon vouchers! A highly divisive issue, the question of feline or canine superiority has been a hot topic for many years, so let’s finally put the matter to rest! Are you cat crazy? Do you go doolally over dogs? Join the debate and you could win a £50 Amazon voucher! To enter, simply follow the link below, let us know which side you’re on and fill in your details for a chance to win a £50 Amazon voucher! And because at The Insurance Emporium, we’re so enthusiastic about all of our four legged friends, we will allow a third option – you can be a fan of both cats and dogs! If you have a furry friend of your own, you’ll always want to be able to share the most magical of adventures together. To provide true peace of mind should anything unfortunate occur, it might be wise to consider insuring your cute cat or daring dog. The Insurance Emporium offer up to 30% discount* on new Pet Insurance policies. Stop by The Insurance Emporium to find out more! * The 30% discount is made up of 20% Introductory Discount plus 10% Multi-pet Discount (if appropriate). The Introductory Discount is available for the first 12 premium payments on lunar and calendar monthly policies or one premium payment on annual policies. This blog is in no way sponsored, endorsed, administered by or associated with Amazon.